This Sunday (25 September) is World Rivers Day. In this blog Judy Proctor writes about the Environment Agency's work to help salmon thrive in England's rivers. I have been leading the salmon 5 point approach for nearly 5 months and I’m hugely excited about the progress everyone is making. I was delighted to become the programme lead and implement a programme which gets us all on the right path to making a real difference for this iconic species. I leapt at the opportunity as it involves not only working across our business but with partners in order to build a different approach to conserving salmon. I bring operational experience, a love of rivers and have always enjoyed working with partners at a strategic level to gain real improvements in environmental growth or natural capital. I get a real buzz working with people who have passion and enthusiasm for salmon and for its conservation be that anglers, partner fisheries organisations and colleagues from across the business. Salmon are truly an iconic species, with smolts, the young fish migrating thousands of miles from UK waters to the Norwegian Sea and some as far as the waters off Greenland and then returning to lay their eggs in their native river. The highest recorded jump for an Atlantic salmon is over 3m or 12 feet and Scotland holds the record for the largest recorded Atlantic Salmon caught, at 29 kg on the Tay in 1922. Salmon also depend on a healthy water environment and so are welcomed by communities for their positive image. 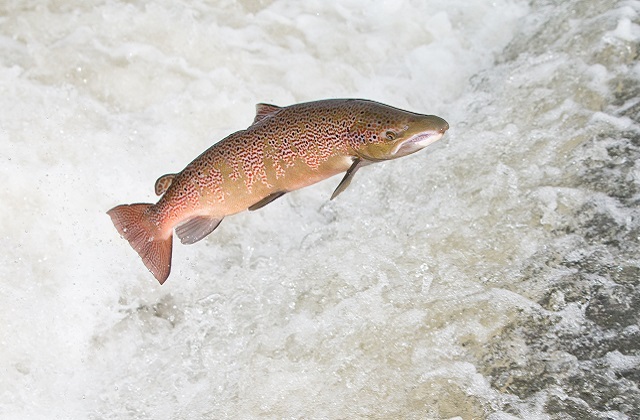 The Environment Agency together with Government and partners are committed to taking action and have launched the Salmon 5 Point Approach seeking to improve their survival at all life cycle stages. This is the programme of work I’m now leading. We have set out an agreed set of priorities which builds on recent successes and is aimed at restoring one of England's most iconic species. We have celebrated many recent successes in protecting salmon, such as building fish passes to open up new stretches of river to salmon to spawn exemplified by the great community work enabling salmon to access new rivers such as the Don. Numerous successes by a huge number of partners and businesses have also sought to maximise spawning success by improving water quality, flows and habitat. 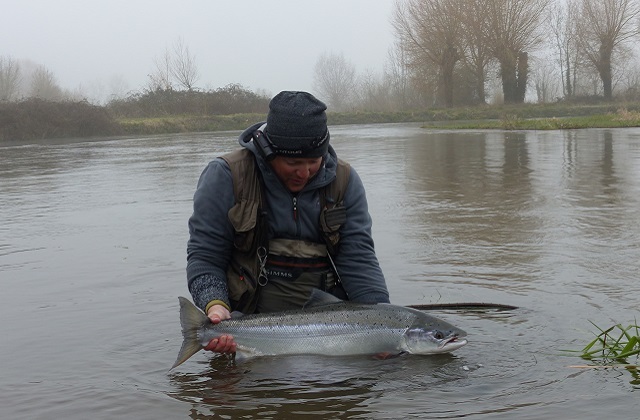 The challenge for us now is to continue with these great projects, inject pace into all we do and work together in partnership to tackle the biggest issues the Atlantic Salmon faces to make a real difference to salmon stocks. For more info on the 5 point approach read this blog by Sarah Chare. Nothing is going to improve whilst they are fishing for salmon up in the arctic feeding grounds. Before these monster, technical fishing boats and their nets there were plenty of salmon in our rivers all we are doing is providing more fish for the professionals to make money from. I have just read an agency article about removing a weir, why was the weir there in the first place? Now that you have removed it the water will flow faster increasing flooding lower down, if you want the fish to get past build a fish pass. I fish the beautiful River Hodder in the Ribble Valley we still get a decent sea trout run but the salmon are becoming a rare occourance . We used to have a fish counter on the Hodder but alas no more it has fallen into disrepair I have talked to the enviroment agency and was told no money available to repair it so no one has any Idea how many fish ascend the river also the salmon propagation scheme has been abandond . I sometimes think these people just pay lip service to the problems and people like Judy Proctor are so out of touch with reality! In-river and farm management improvements are satisfying , tangible aids to migratory salmonids.....but will be no success if pelagic trawling can wipe out a river's smolts in a sweep.. Mr Kendrick's point is fair and perhaps true. What does the EA say on the impact of a high seas fishery. The following report came from Ireland in January 2015 . It does not mention the impact that this ship has on salmon. It does mention how little IS known of its effects. ...this large and efficient trawler ''might be fishing for horse mackerel'' Opined Francis O'Donnell of the Irish FPO and cautioned '' “The enforcement agencies know that they have quota to be there, or at least they think they do, but they actually don’t know what the quota available to these ships is,” he told TheJournal.ie. THE SECOND LARGEST trawler in the world, previously banned from Australian waters, is back off the coast of Ireland – and it has some in the industry concerned. The 143 metre long Margiris is currently sailing along the north coast of Mayo, having entered the Irish European Economic Zone on 7 January. It can process as much as 250 tonnes of fish per day. The ship has sailed under a range of names, including the Abel Tasman, and various nationalities. The vessel is currently being kept under the watchful eye of the Sea-Fisheries Protection Authority, assisted by the Naval Service and Air Corps. “A basic principle of the EU Common Fisheries Policy is shared access for all EU vessels to all EU waters,” a spokesperson for the authority explained. “As a European registered fishing vessel, the Lithuanian registered vessel the Margiris is permitted to operate in any European waters and can fish in any area and retain on board any fish for which it has a nationally assigned European quota. It was the target of an Australian ban on so-called supertrawlers in 2012. The ban was extended just before Christmas to smaller ships, The Australian reports. Local fishing groups have previously expressed grave concern over ships like Margiris, which has far created capacity than many smaller boats combined, when it arrived off the west coast in March last year, soon after the ship was reportedly again refused entry to Australia.